1 The VDRL (Venereal Disease Reference Laboratory) is non-specific but is a useful screening test, becoming positive within 3-4 weeks of the primary infection. It generally becomes negative by 6 months after treatment. It is a quantifiable test which can be used to monitor treatment efficacy and is helpful in assessing disease activity. The VDRL may also become negative in untreated patients (50% of patients with late stage syphilis). False-positive results may occur in other conditions particularly: infectious mononucleosis, hepatitis, Mycoplasma infections, some protozoal infections, cirrhosis, malignancy, autoimmune disease and chronic infections. 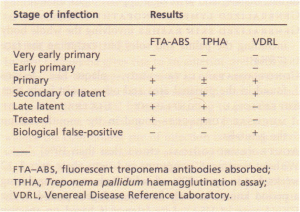 2 T. pallidum haemagglutination assay (TPHA) and fluorescent treponema antibodies absorbed (FTA-ABS) test are both highly specific for treponemal disease but will not differentiate between syphilis and other conditions such as yaws. 3 The FTA-ABS test is positive in more than 90% of patients with primary infection and in all patients with latent and late syphilis. It remains positive for life, even after treatment. 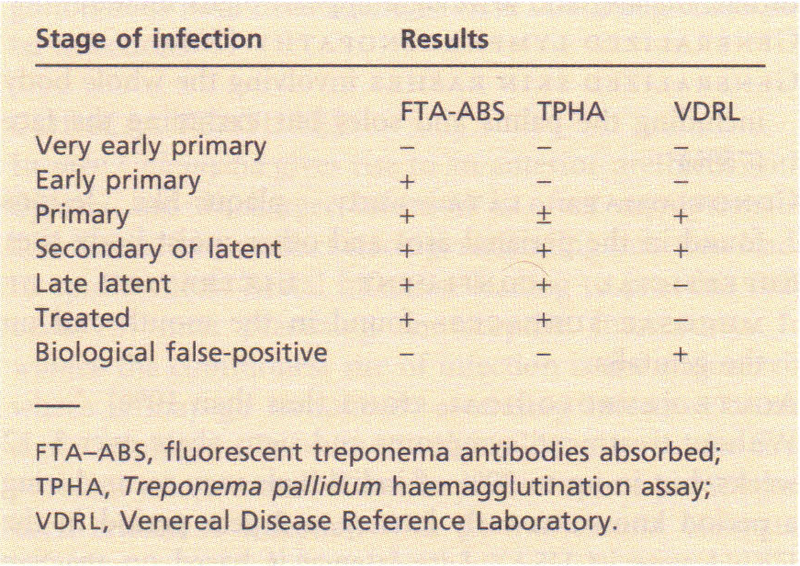 All serological investigations may be negative in early primary syphilis. The diagnosis will then hinge on positive dark-ground microscopy and treatment should not be delayed if serological tests are negative in such situations. In certain cases examination of the CSF for evidence of neurosyphilis and a chest X-ray to determine the extent of cardiovascular disease will be indicated. Early syphilis (primary or secondary) should be treated with long-acting procaine penicillin 1.2 g daily by intramuscular injection for 10 days. When compliance is in doubt, a single injection of benzathine penicillin 2.4 g will maintain adequate levels of drug for approximately 2 weeks. 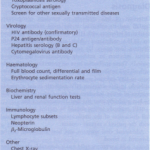 For late stage syphilis, particularly when there is cardiovascular or neurological involvement, the treatment course should be extended to 4 weeks. For patients sensitive to penicillin, either tetracycline or erythromycin may be given. 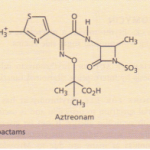 Tetracycline is contraindicated in pregnancy. The Jarisch-Herxheimer reaction, which is due to release of endotoxin when large numbers of organisms are killed by antibiotics, is seen in 50% of patients with primary syphilis and up to 90% of patients with secondary syphilis. It occurs about 8 hours after the first injection and usually consists of mild fever, malaise and headache lasting several hours. In cardiovascular or neurosyphilis the reaction, although rare, may be severe and exacerbate the clinical manifestations. Prednisolone given for 24 hours prior to therapy ameliorates the reaction. Penicillin should not be withheld because of the Jarisch-Herxheimer reaction; since it is not a dose-related phenomenon, there is no value in giving a smaller dose. The prognosis depends on the stage at which the infection is treated. Early and early latent syphilis have an excellent outlook but once extensive tissue damage has occurred in the later stages the damage will not be reversed although the process may be halted. Symptoms in cardiovascular and neurosyphilis may therefore persist. The sexual partners of all patients with early syphilis must be contacted and screened. Chancroid or soft chancre is an acute STD caused by Haemophilus ducreyi. It is common in tropical areas of the world and is endemic in parts of Africa and Asia. Epidemiological studies in Africa have shown an association between genital ulcer disease, frequently chancroid, and the acquisition of HIV infection. A new urgency to control chancroid has resulted from these observations. The incubation period is 4-7 days. An initial erythematous papular lesion forms which then breaks down into an ulcer. Several ulcers may merge to form giant serpiginous lesions. Ulcers appear most commonly on the prepuce and frenulum in men and may erode through tissues. In women the most commonly affected site is the vaginal entrance and the perineum. The lesions in women may go unnoticed. At the same time inguinal lymphadenopathy develops (usually unilateral) and may progress to form large buboes which can suppurate. 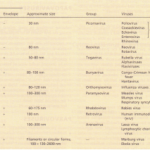 Chancroid must be differentiated from other genital ulcer diseases (see Table 1.36). Isolation of H. ducreyi in specialized culture media is definitive but difficult. Swabs hould be taken from the ulcer and material aspirated from the local lymph nodes for culture. Increasing evidence is appearing of clinically significant plasmid-mediated antibiotic resistance of H. ducreyi. 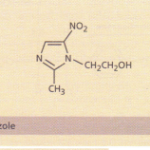 Cotrimoxazole and tetracyclines are the most commonly used agents but newer cephalosporins and quinolones are effective. All sexual partners should be seen and treated.